↑ "Osijek needs €1.9 million a year to fight mosquitoes". Croatian Times. ↑ "Croatia's 'Greenest' City Revealed". Croatian Week. ↑ "Roman period of Osijek's history". City of Osijek official website. ↑ 4.0 4.1 "Osijek - Essek - Mursa : My hometown for more than 74 years". Zvonko Springer on Croatianhistory.net. ↑ "Middle Ages". City of Osijek official website. ↑ "Turkish TV Inspires Croats to Rebuild Old Bridgee". Balkan Insight. ↑ 8.0 8.1 "Osijek after the Turks". City of Osijek official website. 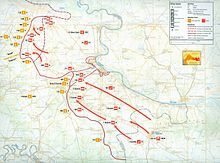 ↑ "THE YUGOSLAV CAMPAIGN". history.army.mil. ↑ "Osijek". Jewish virtual library website. 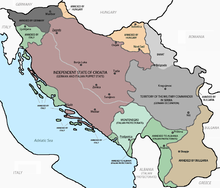 ↑ "Croatian Axis Forces in WWII". feldgrau.com. ↑ "Croatian Activists Commemorate Peace-Seeking Police Chief". Balkan Transitional Justice. ↑ "Crveni fićo, Osijek, 27. lipnja 1991". Kanal korisnika KarabajaCRO Youtube channel. ↑ "Croatian MP jailed for war crimes". BBC News. ↑ "Glavas Case Highlights Impediment to Justice". Institute for war & peace reporting. ↑ "Osijek Airport official website". Osijek Airport. ↑ "Ryanair launching new Ex-Yugo flights". Ex-Yugo Aviation. ↑ "Ryanair Adds London-Osijek Service". Croatia Week. ↑ "Trade air launching scheduled flights". Ex-Yugo Aviation. ↑ "Osijek-Zagreb Flight Returns After 26-Years". Croatia Week. ↑ "First Croatian Tram 130 Years Old Today". Croatian Week. ↑ "Tram line #2 of Osijek". uhi67's channel on Youtube. ↑ "Plague column [Zavjetni stup Svetog Trojstva]". inyourpocket.com. ↑ "Synagogue Location in Upper town - Osijek". Jewish community of Osijek website. ↑ "Osijek Pride 2014". sepamedia.com. ↑ "First Ever Gay Pride Parade in Osijek Incident-Free". Croatian Week. ↑ "About Festival". UFO official website. ↑ "Events". City of Osijek official website. ↑ "Sister cities". City of Osijek official website. ↑ "Minister and his closest associates". Croatian Ministry of Economy website. 24 ตุลาคม พ.ศ. 2557. หน้านี้แก้ไขล่าสุดเมื่อวันที่ 10 ตุลาคม 2559 เวลา 01:58 น.